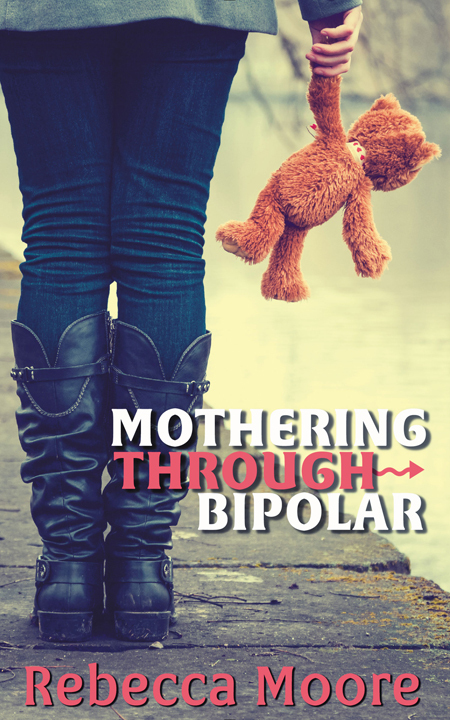 Today’s guest is Rebecca Moore, author of “Mothering Through Bipolar”, a memoir. Welcome, and thanks for guest posting on my blog. Four years ago when I was diagnosed with Bipolar Disorder, I made it my mission to reach out to other parents who were struggling with the same illness. At the time, my illness consumed me and there were many days I couldn’t get out of bed. I needed to find support from other parents and find out how they coped when the symptoms returned and they found themselves unable to push through those hard times. I needed suggestions, advice, but more importantly, I needed a support network. A year passed and I found no other parent that had been diagnosed with Bipolar Disorder. I scoured the internet for hours, even losing sleep during my search, trying to locate just one support group to help me get through. I finally had enough and decided to start my own blog, writing about the coping techniques I found to be helpful and writing about my daily life as a mother with Bipolar Disorder trying to raise a family of seven children. Not an easy task when my youngest child was just a year old herself. But soon enough I had parents searching me out. I was speaking out about my illness, I wasn’t hiding it. I wanted the world to know that moms can have a mental illness and still be great parents. I wanted to be a positive influence on mental health in general. The truth of the matter is, if we didn’t stigmatize against mental illness as much as we do, then maybe those moms would have felt safe enough to reach out to other family members, psychiatrists and therapists and be honest about how they are feeling without fear of judgement or worse, losing their children because of having a mental illness. Pregnancy and the change in hormones that comes with it can change our mental status. We find ourselves having thoughts about harming ourselves or harming our children and these thoughts come out of nowhere. They envelope us in their darkness and with no place to turn for help sometimes we act on what our brains are telling us to do. But there is a solution to this. We can make it safe for moms and dads alike to reach out for help without judgement. We should be able to tell our doctors that we are having thoughts of suicide or worse without fear that we’ll lose our children. We should be commended for taking that step of strength and asking for help. And that is why I write about my illness, that is why I wrote “Mothering Through Bipolar” and that is why I do what I do. I don’t want parents to feel as though they have to hide behind a curtain and not be able to reach out for the help they so desperately need. I was one of those moms who had those scary, dark thoughts. Had I not reached out, I would not be here today to help raise awareness about mental illness. 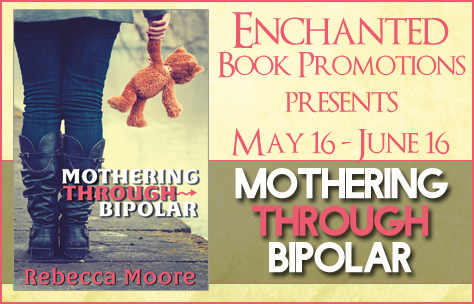 Mothering Through Bipolar is Rebecca’s journey of living with Bipolar Disorder while raising a family of seven children. She takes her readers on an adventure through depression, mania, legal issues, relationship problems and other difficulties. Rebecca offers her readers encouragement, comfort and support; always with a message of hope. Rebecca Moore has been diagnosed with everything from Postpartum Depression to Bipolar Disorder. Rebecca enjoys writing about surviving her journey through mental health and likes to help others who have been there as well. She is a strong Mental Health Advocate for parents living with mental illness. Rebecca is also the CEO of her nonprofit organization, Bipolar Parenting Foundation. She also runs a column on PsychCentral called Bipolar Parenting. 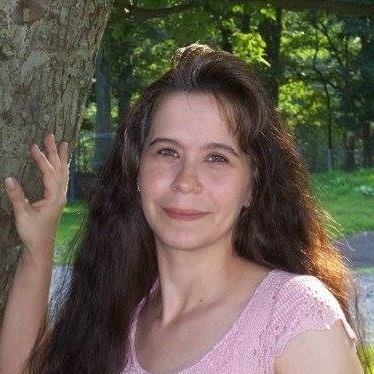 Rebecca lives in Northeastern Pennsylvania with her husband and seven children.